Many people consider reading to be a fairly inexpensive hobby, but if it’s your favorite pastime, you’re aware of how the cost of books can really add up over time. But although many lower-cost book options are available – such as those you can read electronically or listen to on your iPod – the reality is that many voracious readers still want to hold a physical book in their hands. Something about holding a book can be quite relaxing to many readers – and books are both portable and light, making most people reluctant to make the permanent switch over to e-books. 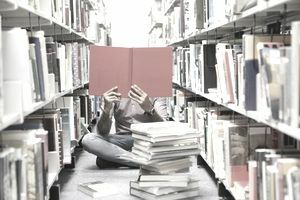 If you’re still interested in buying and reading hardback and paperback books, check out the following five ways you can get cheap books from a wide variety of sources. 1. Visit Online, App-Based Discount Booksellers: If you visit your local thrift store, you can typically find books at $1 or less, and most thrift shops have great offerings in the book department. However, you’re limited to the inventory within driving distance of your home and not everyone has thrift stores nearby that have book departments the size of a Barnes & Noble. Instead, you may want to check out online book discounters, such as HalfPriceBooks or ThriftBooks. These sites allow you to find both new and used books at thrift-store prices, and ThriftBooks’ accompanying app lets you scan in a book’s barcode and find out whether it’s available for less in ThriftBooks’ inventory. Over the course of a year, the savings can add up into the hundreds or even thousands, depending on how many books you buy annually. 2. Check for Steep Discounts With Promo Codes: As noted above, you can find discounted books via online retailers that sell books at deep discounts, or on bigger websites such as Amazon, which sell books cheaper than you can find them in brick and mortar stores. However, you’ll typically be able to find coupons on promo code sites such as RetailMeNot or Coupon Cabin that allow you to get big discounts at brick and mortar stores that will help you save on your book purchases. Retailers like Barnes & Noble, Books A Million and Book Outlet often have coupons for up to 30 percent off on these sites, which can typically be used both in stores and online. 3. Shop at Library, University Book Sales: Once or twice every year, most libraries, universities and other public entities will sell off a large batch of books to make room for new arrivals. These books are typically sold at steep discounts, allowing you a great deal on books and offering the municipality or school a way to bring in much-needed funds. You should check your local library’s sale times, since they usually have them at the same time each year. For instance, one library system in North Carolina sells its books en masse every May, whereas the University of Wisconsin-Madison holds a big sale every October offering books for $5 per bag. 4. Join A Book Swap: Another way to get access to an unlimited trove of books at very low cost is to join a book swap group. You may find them in your area, or you might want to join an online swap, which allows you to join for free and then ship books between members – you only pay the cost of shipping the books. Typically, most of the books will be paperback since those cost less to ship, but you’ll open yourself up to a whole new world of available titles with these services. 5. Cash in Books Using Amazon Trade-In: Believe it or not, Amazon keeps track of all the books you’ve purchased there over the years, and has a running tally of what you can earn if you trade them all back in. Visit Amazon Trade-In and check out how much you can earn by trading your books back to the site – typically Amazon will then resell the books – and you can earn credit back for those trade-ins, which you can put toward new books that you’d like to buy. You can do this in a long-running cycle on a regular schedule. For instance, you may want to check the trade-in site every January, send back the books you no longer need, and use the income from the trade-ins to get more books.